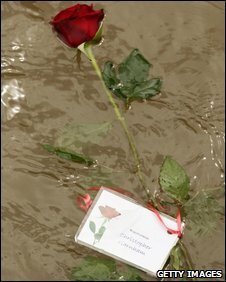 A coastguard placed 51 roses on the Thames to mark the 20th anniversary of the Marchioness disaster, the sinking of a pleasure boat in which 51 died. The names of the dead were also read at a lunchtime service by one survivor, 62-year-old Odette Penwarden. 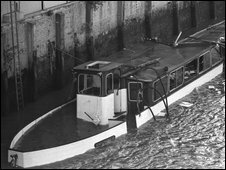 More than 130 partygoers were on the Marchioness when it collided with a dredger, the Bowbelle, and sank near Southwark Bridge on 20 August 1989. A Marine Accident Investigation report blamed poor look-outs on both vessels. Among those paying tribute to the dead was Molly Faldo, from Hornchurch, Essex, whose 29-year-old son Stephen, the skipper of the Marchioness, died in the accident. Mrs Faldo said: "Stephen only married a few months before the accident and he had a yellow theme for his wedding, so we laid yellow roses at the memorial today. "Even after 20 years it does not get any easier to bear." At an evening service families of victims laid wreaths at the Marchioness memorial stone in Southwark Cathedral, near the scene of the disaster. Before laying a wreath earlier, Ms Penwarden, from Beckton, east London, said: "I've had 20 extra years because I should have died that night. "I have tried to live those 20 years for my friends who were killed. I had five friends on that boat and none survived. "I often wonder what they would have done with their lives." The Marchioness had been hired to celebrate the 26th birthday of Cambridge graduate Antonio de Vasconcellos. On board were high-flyers from the worlds of finance and fashion. Francesca Dallaglio, the sister of former England rugby captain Lawrence Dallaglio, was also among the dead. 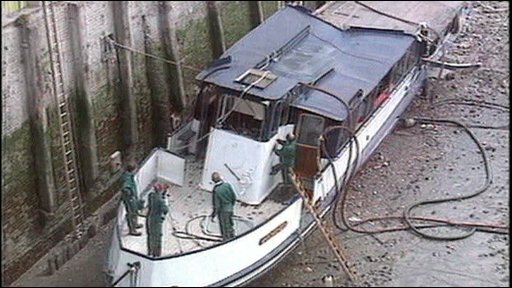 A public inquiry, held in 2000 after pressure from the Marchioness Action Group, supported the conclusion of the Marine Accident Investigation. Lord Justice Clarke was severely critical of Bowbelle captain Douglas Henderson, who had drunk six pints of lager the afternoon before the disaster. He also criticised the owners of both vessels, the Department of Transport and the Port of London Authority. The public inquiry and efforts of the Marchioness Action Group led to improved safety on the Thames, including the launch of a coastguard and RNLI lifeboat service in 2002. The Bowbelle was subsequently sold to a Madeiran dredging company but split in two and sank off the coast of Madeira in 1996.